Choose from PVC or our Eco-Friendly Nitrile rubber with a non-woven fabric top face. Available in various sizes and quantities, order you branded mats NOW! Our PVC bar mats are sure to stand the test of time. These mats are perfect to get your branding noticed more at any ‘point of sale’. Your branding is available in up to 3 custom colours. Available with your own bespoke design, full colour printed with vibrant graphics. There are various size options available. Our Nitrile mats are highly absorbent, easy to clean and machine washable. Each mat comes with a 20mm border. Why not compliment your beverage branding with the new Duro-Lenz decal holders? 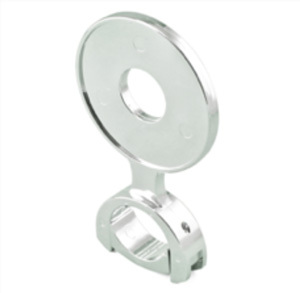 These top-quality mounted decal rings are made from plated chrome plastic and are adjustable to fit most tap designs eliminating the need to remove the tap. Simply remove the screws with a Philips head screwdriver and you’re done. Available in 73mm or 82mm, these holders will seriously compliment your Duro-Lenz tap tops.